A controversial winning goal just before half-time gave Wolves an opening day victory at Blackburn. Midfielder Dave Edwards appeared to divert in Nouha Dicko's cross with a hand to give the visitors the lead. Rovers levelled when Carl Ikeme palmed in Craig Conway's shot, but the hosts could not force a second equaliser. Wolves escaped twice in stoppage time, as Fode Koita hit an upright from the edge of the box and then Corry Evans failed to convert a cross at the back post. Only two minutes had been played when Blackburn striker Jordan Rhodes, the subject of a reported £12m bid from Middlesbrough, hit a post from 25 yards. Rovers defender Shane Duffy sent one header off target and forced Wolves goalkeeper Ikeme to tip another over before Wanderers went in front on the half hour. Afobe, who netted 19 times on loan at MK Dons last term and a further 13 following a January move to Wolves, continued his excellent scoring form from last season when he beat Raya. Conway's deflected effort made it 1-1, before Edwards scored the winner at Ewood Park for the second season in succession - this time in more controversial circumstances. Rhodes shot wide with just Ikeme to beat, while Wolves winger James Henry hit the bar from 25 yards late on, and despite Rovers' late flurry, Wolves held on for victory. Blackburn manager Gary Bowyer: "Jordan's strike was a hell of a strike and it probably sums up the game for us. We're talking about inches and the small margins today. "We've hit the woodwork twice, the goalkeeper has made a couple of decent saves, we have a penalty that is not given and there's massive controversy with what is eventually their winner. "When you put all that evidence before me and ask 'were you unlucky not to come out with something?' Logically it tells you we were very unfortunate." Wolves head coach Kenny Jackett: "It hit his hand, ball to hand. I wouldn't say it was deliberate, but yes it definitely made contact. "It was a whipped cross in and he's gone to head it. You can't have your arms by your side at that point, but did it hit his hand? Yes it did. "It was a great three points away from home. I thought we had spells of possession where we looked very good and the diamond midfield gave us an overload and really helped us in spells." Match ends, Blackburn Rovers 1, Wolverhampton Wanderers 2. Second Half ends, Blackburn Rovers 1, Wolverhampton Wanderers 2. Sheyi Ojo (Wolverhampton Wanderers) is shown the yellow card. Sheyi Ojo (Wolverhampton Wanderers) has gone down, but that's a dive. Attempt missed. Corry Evans (Blackburn Rovers) left footed shot from the left side of the six yard box is close, but misses to the left. Assisted by Grant Hanley with a headed pass following a corner. Attempt saved. Bengali-Fodé Koita (Blackburn Rovers) left footed shot from outside the box is saved in the bottom right corner. Assisted by Ben Marshall. Foul by Bengali-Fodé Koita (Blackburn Rovers). Attempt saved. Bengali-Fodé Koita (Blackburn Rovers) left footed shot from more than 35 yards is saved in the centre of the goal. Assisted by Shane Duffy. Attempt saved. Ben Marshall (Blackburn Rovers) right footed shot from outside the box is saved in the bottom left corner. James Henry (Wolverhampton Wanderers) is shown the yellow card for a bad foul. Substitution, Wolverhampton Wanderers. Sheyi Ojo replaces Nouha Dicko. Corner, Wolverhampton Wanderers. Conceded by Grant Hanley. Attempt saved. Benik Afobe (Wolverhampton Wanderers) right footed shot from outside the box is saved in the top centre of the goal. Attempt blocked. Dave Edwards (Wolverhampton Wanderers) right footed shot from the right side of the box is blocked. Assisted by Dominic Iorfa. James Henry (Wolverhampton Wanderers) hits the bar with a right footed shot from outside the box. Assisted by Benik Afobe. Substitution, Blackburn Rovers. Bengali-Fodé Koita replaces Nathan Delfouneso. Substitution, Blackburn Rovers. Corry Evans replaces Danny Guthrie. 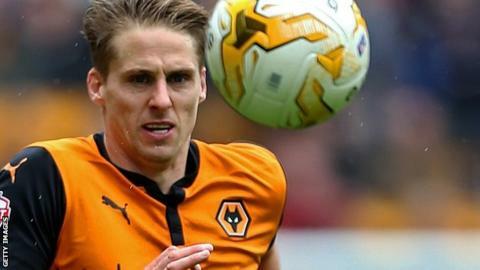 Delay in match Dave Edwards (Wolverhampton Wanderers) because of an injury. Attempt missed. Jordan Rhodes (Blackburn Rovers) right footed shot from the left side of the box is close, but misses to the right. Assisted by Nathan Delfouneso with a headed pass. Attempt missed. Shane Duffy (Blackburn Rovers) header from the centre of the box is just a bit too high. Assisted by Craig Conway following a set piece situation.